The construction project reached a milestone this month when the installation of a fire suppression (sprinkler) system throughout the lower floors of Howard-Tilton Memorial Library was completed. The installation lasted more than a year and in phased sequence affected every area of the library building. Coping with the disruption tended to overshadow the significance of the system itself. The building was constructed in 1968 without a fire sprinkler system, since one was not then required by building codes. Adding two more floors to the building under today's codes made adding such a system mandatory. A fire sprinkler system can be a double-edge sword in a library building. Fire will affect library collections in ways that cannot be repaired. On the other hand, errant sprinkler systems have been known to flood libraries by mistake, requiring costly salvage and restoration efforts. These events are rare, but documented nonetheless. Generally, the proper installation of appropriate fire suppression systems is supported by preservationists in libraries since, in the end, a wet book would be preferable to a burnt one. Importantly, fire sprinkler systems are mainly intended to protect people, especially in multi-story buildings where above 75 feet or so firefighters would have limited ability to provide adequate hose streams to, or rescue from, a raging fire. The architects and project managers for the H-TML addition consulted with the library in addressing the requirements for a fire sprinkler system during the schematic design phase of the project before the construction began. As a result the system for the Howard-Tilton building employs a combination of two sprinkler types: (1) a wet (water-based) system as the norm for most areas of the building and (2) a preaction system for the areas of the building that hold rare collections. Preaction systems also employ water but do not retain water in their pipes, thereby reducing any chance for leakage over especially high value collections. In either type the system operates in an isolated fashion, i.e., a triggered heat sensor would set off only the closest individual sprinkler head, rather than multiple heads or the system as a whole. There were other considerations with fire sprinkler systems beyond basic type and these included method of fire detection and system component variations. These were addressed in the construction design as well. For more information about fire suppression systems see this report from the Northeast Document Conservation Center. A need for first responders to have quick access to controls for the system factored in the design of a large mechanical control area now located on the first floor of the building adjacent to the fire lane between the library and Dixon Hall next door. Most of the library's new main mechanical systems and electrical central plant are now located on the 5th floor far above. The sprinkler installation involved laying out pipelines with connecting sprinkler heads above the ceiling throughout the building, with sprinkler heads eventually poking through the ceiling at 8-foot intervals. The installation began in the northeast quadrant of the 4th floor in February 2014 and was often delayed by differences between actual conditions above the ceilings and the pipe, duct, and conduit locations shown in the original 1967 schematic drawings for the building. The impact of the sprinkler work often left large areas of the book stacks covered with plastic sheeting for long periods while disrupting access to offices, classrooms, and faculty carrels. Early on, the library developed a retrieval system to help library users get books from covered areas. 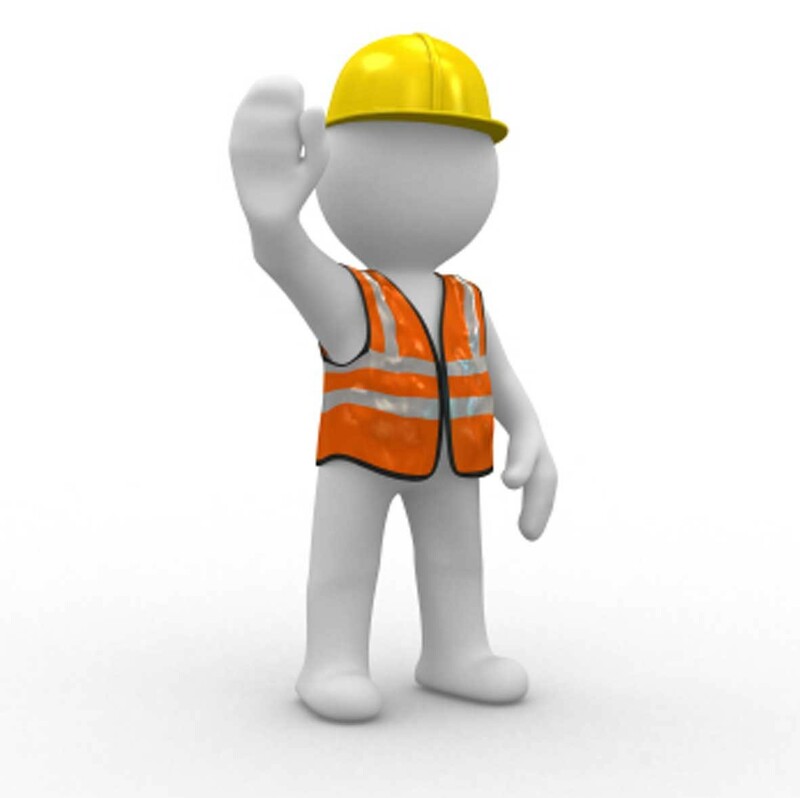 During research-intensive periods in semesters when the installation progressed to the 3rd and then the 2nd floor the library set up a mobile Construction Concierge desk, from which staff or student workers provided onsite assistance . A difficult challenge for the sprinkler subcontractor came this past winter when crews needed to be divided between the work required on the new upper floors and the equally time-sensitive work required to rebuild the ceilings in the 1st floor elevator lobby and adjacent Learning Commons. The final section of the system was completed on July 8 in the southwest quadrant of the 2nd floor. 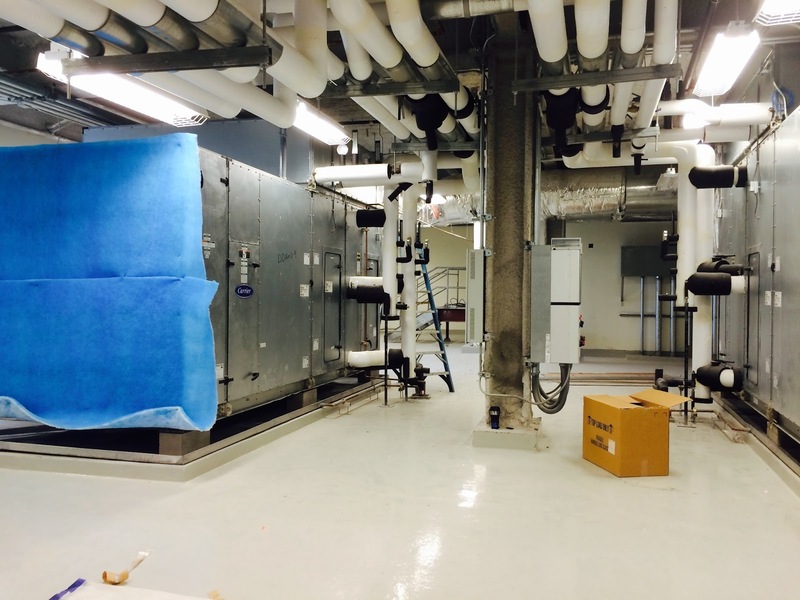 Project managers have set the weekend of August 1 and 2 as the date to begin the start-up, testing, and balancing of the new HVAC (heating, ventilating, and air conditioning) system within the library's lower floors. The start-up will likely begin that Friday evening, July 31, after the library’s normal hours and continue through that Sunday. During that period the library will be closed. Testing and balancing components of the new HVAC system began last week and was limited to the upper 5th and 6th floors. The system is working well and the new upper floors are noticeably cooler than the lower ones still dependent on the ”temporary” blowers, towers, and tubes upon which the library has relied since the building was reopen in spring 2006 after Hurricane Katrina . The closure is a precautionary measure that will allow testing and balancing the system on the lower floors to be done while the library is unoccupied. During the closure air quality in the building would be tested, although the existing duct on the lower floors has been sample-tested for dust and contaminants in recent years with no problems identified. Once the air flow from the new system is properly checked out, a switch to the new system will take place ASAP. 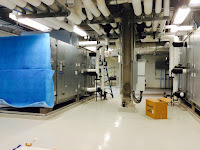 The new HVAC system is part of a new mechanical and electrical central plant that occupies about two-thirds of the floor space on the 5th floor, although the area is walled in and hidden from view. 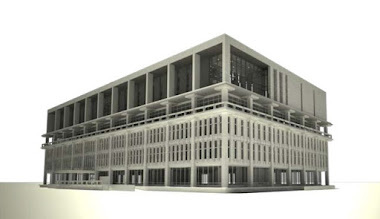 To build these systems on an upper level instead of a ground floor or basement, mechanical/electrical chase spaces through the center core of the building were reconfigured for vertical duct work to feed from the top-down rather than from the basement-up. New vertical duct, electrical conduit, and pipe were tied into the existing lateral distribution systems. Stair and elevator emergency pressurization systems were adjusted to meet current building codes. 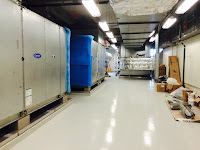 All the new mechanical and electrical equipment has greater capacity to provide service for the two new floors and the mechanical systems include high performance air filtering and temperature/humidity controls. Extra systems were put in place to eliminate any noticeable noise or vibration in all directions outside the mechanical area. All equipment using water or liquid rests on large stainless steel drip pans with drainage systems and equipped with sensors that will shut off units when dripping water or liquid in a pan is detected. 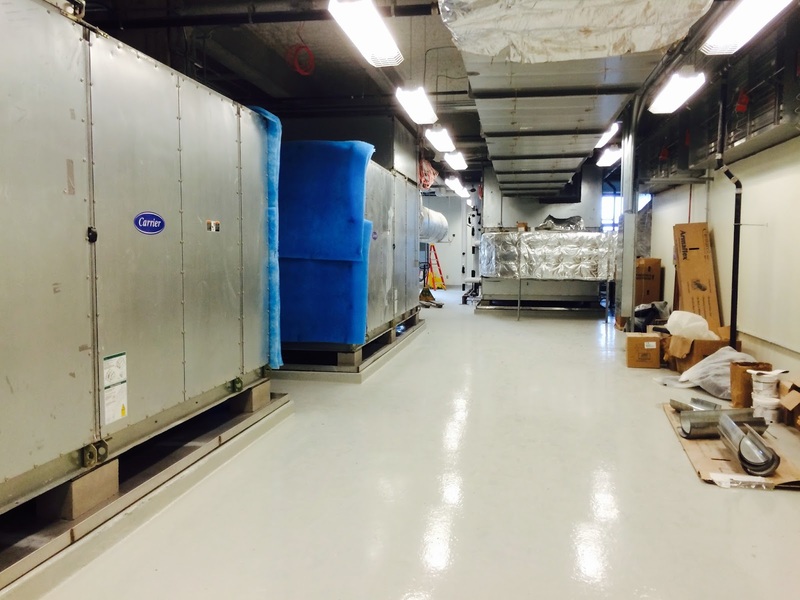 As an added precaution, the floor and lower walls of the entire mechanical area are coated with thick layers of epoxy that produce a seal like a swimming pool and the floor itself has drains. The 5th and 6th floor construction scope includes removing all the old hanging tube that serves as temporary air duct on floors 1-4 of the building and replacing all the lower floor windows and transoms displaced by the tubes. Also included would be any other related interior repairs. Outside, the contractor will remove all the towers, blower units, and temporary chilled water pipe behind the building and restore that area to pre-Katrina condition as well. This dismantling of the old HVAC system and related repairs is expected to be completed in August. Work to build stairs for the library's new 5th and 6th floors in its central stairwell officially began today (Wednesday, July 22). 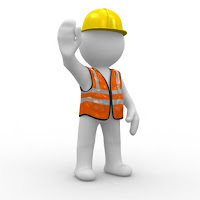 As a result the stairwell is expected to be closed for use for 3 to 4 weeks, which is an ambitious time frame given the work that will be required to cast the stairs in place. Both of the library’s other stairwells, at the Dixon Hall (north) and Freret Street (south) ends of the building, will be available during the central stairwell closure. Each section of the upper floor central stairs to be built will be large and very heavy, and their construction will be a complex undertaking. A number of options for building or installing the stairs were explored. The first required an elaborate but too-disruptive plan to crane-hoist precast stair sections weighing 15 tons apiece into the building through the openings for the buck hoist external elevator then cabled them diagonally across the floor to where they will be fitted into place within the stairs using a complex system of pulleys and other equipment. This would have required additional work to reinforce the 5th floor with a few dozen temporary shoring posts set underneath on the 4th floor in areas including the Music & Media Center and LAL book stacks. Another option involved having precast stairs delivered in smaller, less load-sensitive pieces from the manufacturer, but this was determined to be unfeasible. A later plan would have cut a hole in the roof above the stairwell to lower the precast stair pieces directly into place from overhead by crane; this option was determined to be feasible but, the part of about cutting a hole in the new roof was decided to be something to avoid if another way could be found. In the end, casting the stairs in place was found to be by far the safest and least disruptive option. The work will include within the stairwell the erection of scaffolding and structural supports as well as the concrete forms for the stairs themselves. Once rebar is laid and the concrete is poured and dried within the forms, the forms will be removed and then the stairs will need detailed finish work. To reduce the scope of the work within the period in which the stairwell will be closed, the construction contractor no longer plans to include the installation of new handrails for the central stairs on floors 1-4. The handrails will be installed later in a separate phased effort that won’t necessarily require closure of the entire stairwell. HVAC: The library has been cooled since Katrina with a temporary HVAC system represented by the eight galvanized steel towers along the back of the building feeding the plastic interior overhead tubes through which air is pumped to each floor. 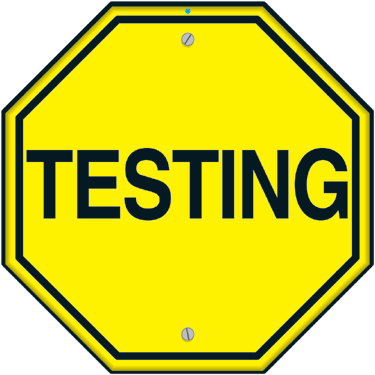 Technicians this month will begin testing and balancing components of the new HVAC system for the building built on the 5th floor. 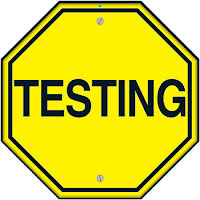 The testing will be limited to the upper floors first and then the building will likely be closed for the first couple of days when air from the new system is finally pumped through existing duct into the lower floors. Dates for the closures,which will allow for air quality testing, will be announced in advance. Elevators: Earlier this month Schindler Elevator Company completed work on elevator #3, which was the first of the rebuilt elevators, extended to the 5th and 6th floors, to come back on line. With elevator #3 fully tested, old elevator #1 was finally shut down for its rebuild. A rebuilt elevator #2, which will share a vertical rail with elevator #1, will be operational as soon as that shared rail is replaced with one that extends to the 5th and 6th floor. Both elevators #1 and #2 are expected to be brought back into service in October. Central Stairwell: Later this month the library's central stairwell will be closed so that crews can construct the stairs for the 5th and 6th floors above. During this time users will still have access to floors 2-4 from the two smaller stairwells on the Freret Street (south) and Dixon Hall (north) sides of the building and also via the rebuilt elevator #3 . Meanwhile, workers have been completing the installation of new metal doors and overhead transoms at the entrances to the stairwell on floors 2-4. Work on the fire-rated glass enclosure around the entrance to the central stairwell on the 1st floor was completed at the start of the summer session in June. The remaining work within this stairwell includes the installation of new handrails on floors 1-6. Additional Stairwell Work: The contractor has completed the installation of new railings in the stairwells on the Dixon Hall (north) side and on the Freret Street (south) side of the building. Crews are now painting the new handrails and touching up the paint on the stairwell walls, alternating stairwell closures while the painting is underway. Roof Replacement: The roofing subcontractor on the project is completing work to replace the top sheets on the new roof, which did not pass some rigorous inspection tests. The main problem was apparently uncovered in a test for wind uplift, which is conducted to identify whether the vacuum produced by high winds crossing the roof would create any separation in the top sheets of roof layers. These are laid above a base roof layer of lightweight concrete. The top sheets are supposed to remain sealed together, but the tests showed some separation, which theoretically could result in tearing (holes). The additional roof work was not expected to delay the overall completion of the construction project. FF&E: The interior design firm F E R R A N D d e s i g n has been selected to manage the Furniture, Fixtures, and Equipment (FF&E) portion of the construction project. FF&E in this case will be limited to the selection of furniture because furniture layouts and most furniture types were approved by FEMA in the design phase of the project. The FF&E architect will work closely with Tulane’s Capital Projects & Real Estate Department and the Office of the Campus Architect. The library will have input in the selection process as well. Shelving: All the shelving for the upper floors —both traditional shelving and high density mobile units—has been ordered. Rails for the high density shelving have already been installed. More shelving components will begin to arrive in a few weeks. Collections Moving: Work on an RFP to hire a qualified library mover to eventually move collections to the new upper floors (and to restore order to the lowers ones) is underway. The moving project will be enormous and must involve the careful packing, transport, and reshelving of more than 55,000 linear feet of library collections. The move will likely be split into three phases with the first expected to begin in late fall, the second to take place during the winter intersession, and the last expected to begin next spring. Sprinkler System: Work on the installation of the fire suppression (sprinkler) system for the lower floors (1-4) was finally completed last week, as crews wrapped up the installation of overhead pipe and sprinkler heads in the southwest quadrant of the 2nd floor.